Rick Dobson, the ProgrammingMSAccess.com's webmaster, offers a welcome to Access, VBA, SQL Server, and Visual Basic .NET developers. If you are a new site visitor or you haven't visited recently, we invite you to take a look. In early September, 2006, the webmaster delivered an MSDN webcast on preparing for the 70-431 exam for SQL Server 2005. Those who pass this exam earn a Microsoft Certified Technical Specialist (MCTS) credential. The Microsoft site includes a page summarizing the exam. You can find a link for viewing my webcast presentation's slide deck in Articles, tutorials, & more. The T-SQL code samples for the presentation are available along with a large selection of other code samples from this site. Enjoy! We are proud to announce the publication of the webmaster's seventh book on Microsoft database development. The new book's title is "Beginning SQL Server 2005 Express Database Applications with Visual Basic Express and Visual Web Developer Express". This site features a FAQ with in-depth coverage of the book and its technologies as a well as a detailed table of contents. The site also features other valuable links for the book. After learning about the book from this site, we invite you to purchase it from Amazon.com. BTW, this book achieve best-seller status in the SQL Server Express category at Amazon.com. Please take a moment to look over our seminar on SQL Server Express, Visual Basic Express, and Visual Web Developer Express. Microsoft wants you to use these products so much that they are literally giving them away. Our seminar ramps you up the learning curve so that you can derive the maximum benefit from these new database development tools from Microsoft. Although the three presentations of our 21-hour seminar are completed for March-April, we may offer more seminar presentations early in 2007 along with a second seminar to help you pass the Microsoft 70-431 certification examination. Click the image below to learn more about our seminar. Feel free to leave a comment in our Guest Book letting us know when you want the seminar offered again. Tired of getting more spam than legitimate email in your Outlook Inbox? We invite you to take a look at SPAM Blocker, which is this site's VBA-based approach to filtering spam. We just updated its filters. SPAM Blocker was never better than it is right now at blocking spam! Wondering if the DDG is for you? Well, membership has its privileges. Especially popular ones include the opportunity to get published as a product, book, or DVD reviewer, the chance to get featured in our quarterly profiles of members, and a 10% rebate on registration fees for major seminar tours. Take a moment to look over excerpts from previously profiled members. You might find out that these are folks just like you! If they joined, maybe you should too. Click here to join now. Are you looking for motivated database development professionals? Our current roster of Database Developers Group (DDG) members stretches from coast to coast and overseas as well! DDG members have full and part-time consulting practices with the resources and experiences to solve your problems at the price you can afford. Click our Technical Support link to learn more about how you can get help from our DDG members. 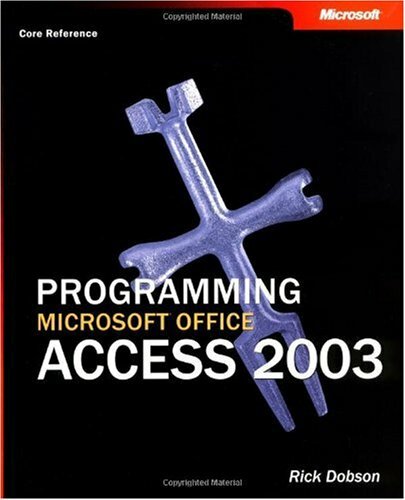 If you are looking for a quality book on developing solutions with Access 2003, "Programming Microsoft Office Access 2003" may be the one for you. It is the third edition of Rick Dobson's Programming Microsoft Access book series. In the webmaster's most recent book on Access programming, you will find plenty of ADO samples, along with expanded coverage of many topics, including Access/Excel interoperability, Access/Outlook interoperability, and user-level security. In response to popular demand, I revised and enlarged the coverage of Access/SQL Server interoperability. In addition, there is a whole chapter on XML and special need-to-know content on new security features introduced with Access 2003. We added links to ten articles by the webmaster at Microsoft's MSDN site that cover a variety of topics, including SQL Server Express, Access programming, SQL Server security, VBA & and Visual Basic .NET. If you are a new visitor, we invite you to take a look at prior newsletter messages to registered site visitors. These messages convey special content and opportunities available from the site. You can become a registered site visitor as easily as signing our Guest Book. Check out our slide deck on developing Access forms and reports. The presentation targets intermediate level Access developers. The content includes coverage of how to dynamically format forms and reports, how to programmatically assign Recordset and RecordSource property values at run time, and how to work with main/sub forms and subdatasheets. The slide deck also mentions advanced techniques for referencing a sub form from a main form. See our Presentation area for a link to the slide deck. Microsoft selected the ProgrammingMSAccess.com Webmaster, Rick Dobson, as an Access hero to help celebrate the tenth anniversary for Access. Click here to read Rick's Access hero story. Rick is the author of four books that include Access in the title. He is also an MCP in Visual Basic .NET. Check out our Product Reviews section. Each quarter we add a new product reviews, which can target software products or books. Reviews are contributed by members of the Database Developers Group (DDG). 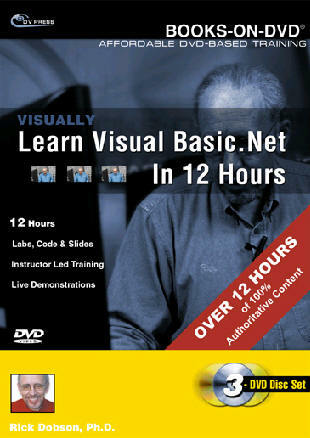 About the books and DVDs: Rick Dobson is the author of six books and one DVD on Access, SQL Server, and Visual Basic .NET development. These books offer thorough coverage of programming topics for Access and SQL Server development with VBA and Visual Basic .NET. Here are brief summaries of selected books with links for learning more. Also, use the links from the covers to the right. 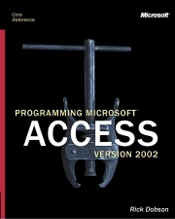 Programming Microsoft Office Access 2003 targets Access developers who want to get the most out of Access 2003 (and earlier versions of Access too). This book adds new content that is unique to Access 2003. In addition, the book enriches and refocuses content from earlier versions to help practicing Access developers solve everyday problems. This book includes hundreds of code samples with text that walks you through the solutions. 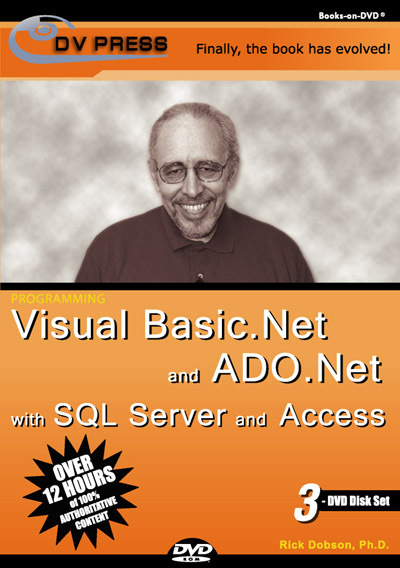 Programming Microsoft Visual Basic .NET for Microsoft Access Databases presents Visual Basic .NET development techniques for Access databases. If you currently use Access databases and you want to ramp up to speed on the .NET Framework, this is for you. 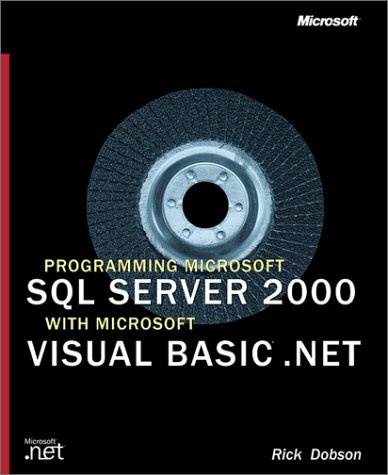 Programming Microsoft SQL Server 2000 with Microsoft Visual Basic .NET introduces VB developers to both SQL Server and Visual Basic .NET. Its ADO.NET coverage is much more SQL Server centric than general .NET books. In addition, the book includes three chapters XML processing techniques for SQL Server and Visual Basic .NET. The book's final chapter drills down on XML Web Services, including the SQL Server 2000 Web Services Toolkit. 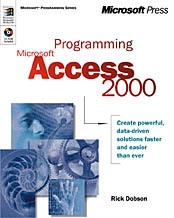 Programming Microsoft Access Version 2002 carefully examines the latest features in Access 2002 as it provides special coverage of interoperability features between Access 2002 and SQL Server 2000. Excerpts from the Programming Microsoft Access Version 2002 book give you a chance to try before you buy. Most of the samples in this material work with earlier versions of Access as well. 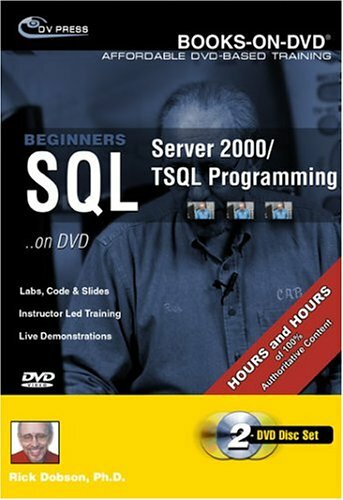 Professional SQL Server Development with Access 2000 drills down on techniques for creating SQL Server solutions with Access. 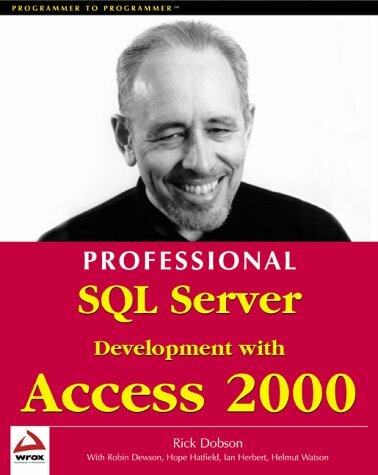 While the book especially targets Access 2000 developers using SQL Server 7, there is plenty of valuable content for developers using either Access 2002 or SQL Server 2000. Programming Microsoft Access 2000 targets beginning and intermediate developers seeking to learn ADO and get a good grasp of the feature set offered by Access 2000. This book is out of print at Amazon.com, bn.com, and other online book sellers. We recommend Programming Microsoft Access Version 2002 or Programming Microsoft Office Access 2003 as excellent replacements for this book.